Having completely sold out of visitor registrations, Future Decoded 2018 welcomed 12,000 IT professionals to the London ExCeL convention centre on 31 October and 1 November. 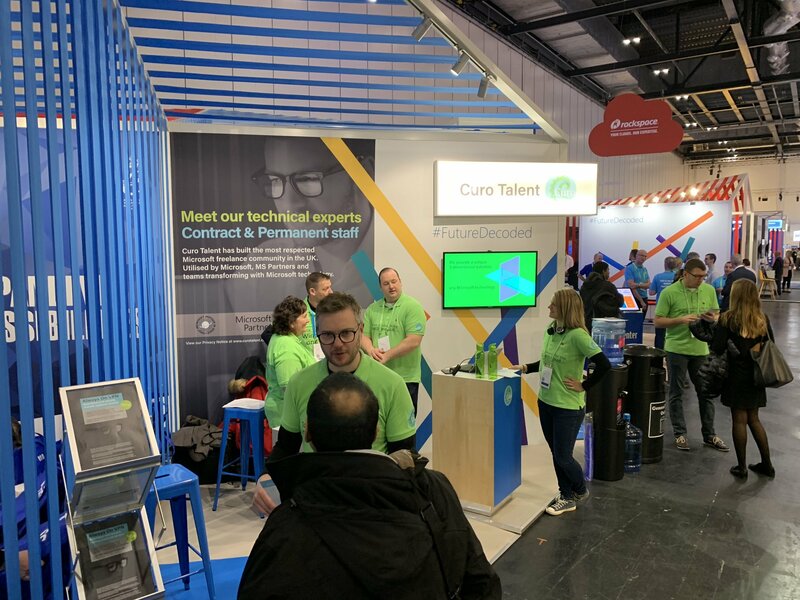 Here, Annie Andrews, Head of Technology at Microsoft recruitment partner Curo Talent, rounds-up the highlights of the event, focusing on how accessibility in technology and using AI for Good could help to alleviate the industry’s notorious skill shortage. AI has a reputation as a potentially menacing technology. At least, that’s what science fiction would have us believe. Future Decoded proved differently, examining how positive applications of AI are becoming ubiquitous in existing technologies and how new inventions are improving accessibility in tech. Assistive technology start-up company BrightSign provided an inspiring example of how AI can improve communications. Using motion sensing technology, the BrightSign glove works by translating sign language gestures into audible speech, giving a voice to those that cannot speak. Similarly, Microsoft research project Soundscape was highlighted as a technology that could help those with blindness or low vision better navigate the world. Soundscape was introduced by Microsoft’s chief accessibility officer Jenny Lay-Flurrie. The audio-based technology uses a headset to provide users with an immersive description of their landscape, providing them with more confidence to map their environment while walking around. Considering the well documented skills shortage the technology sector is facing, Jenny’s sentiment is of the utmost importance. Postings for IT jobs in the UK surpassed 290,000 in the final quarter of 2017, accounting for 13% of all jobs advertised. It is imperative that there are no barriers to talent in technology especially while the industry is experiencing such a widespread shortage of skills, particularly in relation to the estimated one billion people living with disabilities worldwide. Microsoft is already taking positive steps to improve accessibility in its platforms by using AI to complete certain functions. In fact, Michael Wignall, chief technology officer at Microsoft UK, spoke extensively about how AI is becoming ubiquitous in existing technologies. This includes common Microsoft applications such as Dynamics 365 and Office 365, both of which use AI under the covers, for example in the built-in smart search capabilities. In Office 365, the Check Accessibility function can automatically examine documents to provide tips on how to make the file friendlier to those with disabilities. For instance, including alternative text with all visuals helps people who cannot see the screen understand what is important in the images used. PowerPoint, as another example, uses the Presentation Translator add-in to offer automatic translations of spoken presentations in up to 60 different languages, in real-time for live presentations. What’s more, applications in development, such as Microsoft EyeDrive, will improve this further by providing greater accessibility to technology to those without good motor control. This application uses eye control to allow users to move a mouse pointer across a computer screen without the need to manually touch a device. Microsoft’s focus on accessibility at Future Decoded 2018 should serve as a reminder that we must break down the barriers in technology, particularly while the industry strives to recruit more talent. This includes encouraging a more diverse intake of candidates using more inclusive hiring techniques. However, this was not the only effort made by Microsoft to tackle the industry’s skill shortage. Future Decoded also saw the launch of new initiatives like MS Learn and the AI Academy — a scheme intended to confront the lack of knowledge surrounding AI technologies. According to the Maximising the AI Opportunity report, which was distributed at Future Decoded, 51% of business leaders do not currently have an AI strategy in place. Considering the huge focus on AI at this year’s event, it is imperative that the industry takes steps to learn about AI and how this will impact business models in the future. As it stands, businesses often rely on specialist contractors to deal with projects related to AI. Curo Talent has first-hand experience of the high demand for these experts. What’s more, this demand is on the rise. Thankfully, schemes like the Microsoft AI Academy will help to tackle this shortage. AI has long been depicted in popular culture, TV and film as a potentially menacing tool. However, Future Decoded illustrated the need for this technology to encourage and enable greater accessibility in the tech sector. We have already witnessed the arrival of a myriad of impressive technologies designed to improve accessibility. Looking to the future, some of these AI-enabled tools could be used to close the gap on the industry’s looming skills shortage.